When they were little, it was the stuff of nightmares for Cristina, 17, Angela, 22, and their brother, Max, 23, who were born in Mexico, as well as Edith, 21, who was born in the U.S. and feared she would be left behind. 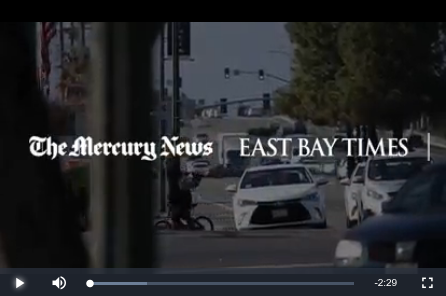 But now, with rumors swirling around the Bay Area that federal immigration raids could be imminent and anti-immigrant political rhetoric escalating, worries that their family could be torn apart seem tangibly real. Like immigrants across the Bay Area and around the country, their fates lie in the hands of a contorted Congress and a mercurial president who can’t come to terms over immigration legislation. President Trump’s latest proposal would create a path to citizenship for 1.8 million young undocumented immigrants, known as “Dreamers,” who were brought to the country illegally as children. That’s nearly double the number who were protected under the Obama administration, but Trump’s plan would strictly limit families from bringing relatives — other than spouses or children — to the U.S. and end the visa lottery system. It also would beef up immigration enforcement and set aside $25 billion for a border wall. The trade-offs generated criticism late last week from both political parties. California’s senior senator, Dianne Feinstein, could have been describing the Perez family when she blasted the president’s latest plan. Trump’s proposal would protect Perez’s two children who are “Dreamers” — Angela, a senior at Cal State Long Beach, and Max, a security guard at a retailer — and likely the youngest of the family, Cristina, a Silver Creek High School junior who has yet to apply. But it won’t help their father in San Jose or their mother, who doesn’t live with the family. The rhetoric from Capitol Hill has shaken immigrant communities throughout the state since Thomas Homan, the acting director of the U.S. Immigration and Customs Enforcement, told Fox News earlier this month that “California better hold on tight” and threatened a crackdown on the Golden State over its “sanctuary” policies that prevent local law enforcement from working with federal immigration officials. Because none of the Perez family has a criminal record, the family says, they are not supposed to be the target of any potential ICE raid. But there are reports that even those with clean records can be swept up as “collateral” arrests. Ernesto, 48, the family patriarch, works the night shift as a janitor and fears that could happen to him. Nearly 1 in 10 California workers are undocumented, according to a March 2017 report from the Public Policy Institute of California, a nonpartisan research group. The youngest, Cristina, avoided a local Mexican market for weeks after a friend told her about rumors that ICE was making arrests there. Her teachers have told her that ICE agents can’t come into the classrooms, but when she walks home alone from school, she’s always looking over her shoulder. The dreaded prospect that one or more of her family members could be deported at any moment has created both bonds and fissures within the Perez family, which has put down roots in San Jose. They first arrived in 1995, with the two eldest children in tow. Edith was born here, but Cristina was born in Mexico when the family returned to tend to her dying grandmother. Ernesto says he couldn’t find work in his home country and knew his family’s prospects for work and education were better in the U.S., so in 2003, when Cristina was 3, the family returned to San Jose — the children smuggled by car with family friends, the parents crossing the Arizona desert. Cristina has accompanied her father to pro-immigrant rallies, where he has marched and given speeches. Edith — a student at DeAnza College and an employee at a high-end retailer — frequently texts her older sister, Angela, warning her to “be careful, watch out” when she hears about ICE raids in Southern California. At the same time, Edith says she has to cope with taunts from her brother that she is lucky to receive the privileges of citizenship while the rest of the family suffers without. Ernesto, meanwhile, is trying to keep the family close. He rents two bedrooms for himself and his two youngest daughters in a small East San Jose home they share with another family of five. He cleans office buildings on the night shift and during the day coaches kids soccer and volunteers at his church and with PACT — People Acting in Community Together — a social justice group that advocates for immigrant families such as his. He’s proud of what his children are accomplishing so far in their young lives, and wants them to continue to thrive and prosper in a country they all love and consider their own. Max is doing well in his security job. Edith is hoping to transfer to UC Davis. Angela wants to go to law school and advocate for battered women and immigrants. And Cristina wants to be a journalist. They all know they are taking a risk by putting their names and photographs out in the media. So many undocumented immigrants remain in the shadows. Angela, at Long Beach State, says she has pulled back on her activism at rallies for fear she could be detained.